“– Silence is a key element in my music. Before the music starts, the silence is full of expectations and excitement. The silence returns when the music ends, but now it is filled with echoes that invade the silence. My thoughts remain immersed in pictures that linger beyond the sound of the guitar. These moments are vital to the creative process: nevertheless they last only a few moments“. To me, the sound from a classical guitar is the most beautiful sound I can imagine; the softness of the tone, the perfect decline of a plucked string, once described by the great classical guitarist Julian Bream as “the perfect death” and not least; the chords, harmonies created when several strings are plucked at the same time. While many consider music and playing the guitar a “competition” or challenge how fast and loud you can play, I tend to look inwards in search for the feelings, expressions and moods one can create with music. With that in mind, the classical guitar is the perfect instrument and tool. Per-Olov Kindgren (born June 10, 1956 in Bogotá, Colombia) is a Swedish classical guitarist, composer and music teacher known for his classical guitar playing, ranging from Bach to The Beatles. Kindgren was born in Bogotá, Colombia, to a Swedish father and a more Danish mother. Kindgren’s father, Owe, an engineer, worked for the Colombian branch of LM Ericsson installing telephone stations. The family returned to Stockholm when Kindgren was three years old. He lived there from 1960 till 1970. At the age of six, Kindgren was fascinated by a bright red electric guitar in a shop window. The Beatles became his heroes, and he especially admired Paul McCartney. His parents gave him a classical guitar for his seventh birthday. In 1970 he saw a documentary about John Williams broadcast on Danish national television, and from that day on, he knew what he wanted to become. When Kindgren was 14 years old, his family moved to the border town of Helsingør inDenmark. There he could more easily attend a Swedish high school in Helsingborg, where he met his first classical guitar teacher, Torvald Nilsson. In 1976 Kindgren began to study at The Royal Danish Academy of Music in Copenhagen, where he moved during his studies and where he lives and works today. He studied there for 7 years with professor Per-Olof Johnson until his graduation in 1983. While continuing his studies, he became a music teacher, teaching at music schools in Vallensbæk and Gentofte for 24 years. Presently Kindgren works as a music teacher at the music school in Gentofte, which provides him with a steady living in addition to the concerts he performs. In 1979 he joined with three other guitarists, forming the Nordic Guitar Quartet, which performed more than 400 concerts through the years. Kindgren composes pieces for solo guitar, as well as for duets, trios, quartets, and up to septets and octets for guitar. In 1998 he composed pieces for choir, orchestra, and a rock band for the 25th anniversary of the Vallensbæk music school; in 2000 he composed a Christmas Oratorio for organ, guitar, flutes, choir and narrator. 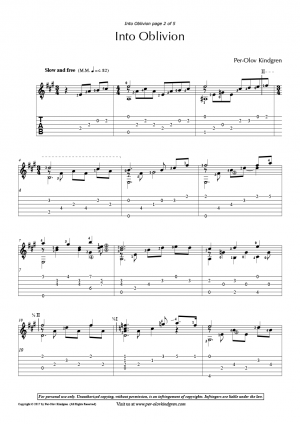 In 2009, the great French guitarist and composer Jean Marie Raymond wrote for him a beautiful piece, a little jewel called “As Always.”. Kindgren’s style is mainly classical, with influences from jazz, blues, and easy listening. In addition to his classical repertoire, Kindgren also plays works of The Beatles and Metallica. Kindgren likes to describe his own compositions as songs without words. For many years Kindgren played a classical guitar built by Swiss luthier Philippe Jean-Mairet, which he bought in 1987. In the summer 2006, Kindgren went to guitar builder Per Hallgren in Gråbo, near Gothenburg, in order to have the guitar french polished again. In 2009 he started to play a guitar by Per Hallgren and since then he has played several instruments by the Swedish builder. He also plays a 7-string classical guitar and an 11-stringed Alto guitar given to him by John Rogerson in Durham outside Newcastle, England. Since 2014 he also plays a spruce top guitar by Thomas Holt that is only 640mm in string length. In his videos, Kindgren can be seen using a Kris Barnett guitar support on his left lap. 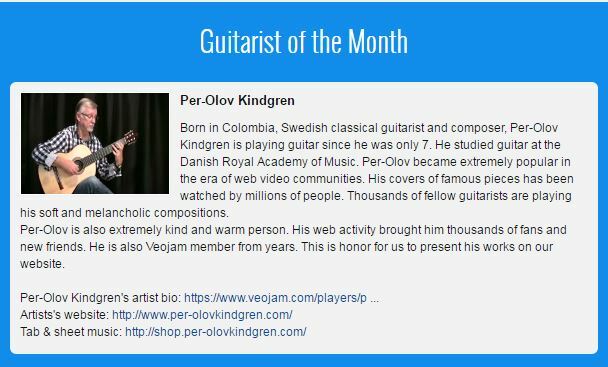 I was “Guitarist of the Month” for the third time at Veojam in December 2016.